Soccer, one of the most popular contact sports has many lower leg injures. The legs are most often injured due to the contact nature of the sport. Injuries can be either due to a traumatic kick , or twisting/pivoting on the knee. Injuries can even be due to overuse of muscles/ligaments around your hip/knee/ankle joints. 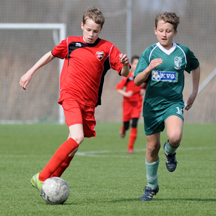 Tears to the Anterior cruciate ligament are one of the most common soccer injuries. https://www.youtube.com/watch?v=PxQJdB-EKwo Check out this video to see some of the worst soccer videos. The anterior cruciate ligament is a band of connective tissue connecting the lower end of your thigh bone(femur) to your lower leg bone(tibia) within the knee joint. It is very tough and believed to be one of the strongest ligaments in your knee. The ACL functions to control excessive/abrupt motion of your lower leg bone when involved in activities like kicking. Kicking involves a rapid forward motion of the lower leg bone that might overstretch/tear your ACL. If you tear the ACL, you might hear a pop or loud snap when the ligament is torn. This can cause excruciating pain and/or swelling in your knee. Soccer players usually find it hard to put weight on their injured leg after an ACL injury. They have a feeling of instability in the knee. They need to be taken out of the game for further investigations and treatment. An ACL tear is one of the most common soccer injuries. Your Registered Physiotherapist Mississauga can do an exam either at the field of play or in the office. They will be able to assess if there is any laxity in your knee. Laxity usually means that the ACL has been injured. Your physician usually requests an MRI to confirm the location and extent of the tear along with any other injuries following examination of your knee. Registered Physiotherapists Mississauga can help you recover faster following your ACL injury. This will help you to return to sports as soon as possible. Registered Physiotherapists Mississauga help to manage your pain and swelling during the initial phases of recovery by providing compression to the area using a compression stocking and using ice around your knee joint. It’s usually done with your leg elevated so that gravity can further help in draining your knee of swelling. As part of your home exercise, an ankle-pumping exercise is advised. Also, it is recommended that you do not keep your knee in a dependent position such as prolonged sitting with your feet dangling in the air. This can cause your knee to swell more. Registered Physiotherapists Mississauga might use electrical stimulation (TENS) to further help with draining of the fluid in your knee joint. TENS helps to stimulate muscle contraction around your knee joint which helps to drain the fluid from your knee joint. Yes, there are many ways to control the swelling around your knee joint and Registered Physiotherapists can assist in your road to recovery following ACL injury. Registered Physiotherapists Mississauga can help you get back strength and range of motion in your knee using various joint mobilisation techniques and exercises. Physiotherapy, proprioceptive retraining and balance exercises are all useful in your recovery. Initial phase of return to sports: Your Registered Physiotherapist Mississauga might recommend the use of a Custom Knee Brace to further protect your healing ligament and guard against any forces that might lead to a recurrent knee injury. PhysioNow has a full supply of the best Custom Knee Braces on the Market including DonJoy, Bledsoe and Ossur braces. If you think that you might need a Knee Brace, call us today. We have many off the shelf Knee Braces and Custom Knee Braces available. We can assess your knee and help to advise on best steps for if you require a Knee Brace. 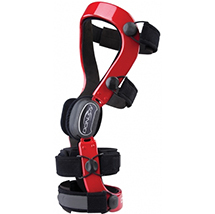 It takes about one week to receive a Custom Knee Brace although Rush braces can be received faster if necessary.